I’ve been working as an engineer at Samsung since 2011, and the changes when it comes to my day-to-day work while challenging my creativity and capabilities to the fullest, have been exhilarating. Today, no one day is alike. I can be diagramming a new idea, not tasked by anyone, in the morning, vigorously debating its feasibility with senior engineers alongside fresh-out-of university staff a few hours later, and then tinkering with the idea in the lab by the end of the day. I credit this change to C-Lab. When you think startup, the first images that likely pop to mind are makeshift groups of fresh, enthusiastic innovators, entrepreneurs, and engineers dreaming of creative ideas, and pouring their passions to bring their ideas to life. While scenes like this may be expected in the Silicon Valley’s or New York’s of the world, they might seem too difficult to imagine, much the less instil, at large and complex, multi-layered corporations with extensive webs of stakeholders. Or might such implementation require a spirit of adventure to be sure, and willingness to view failures as opportunities, but be a radical vision for how an organization can keep brewing innovation for the future? 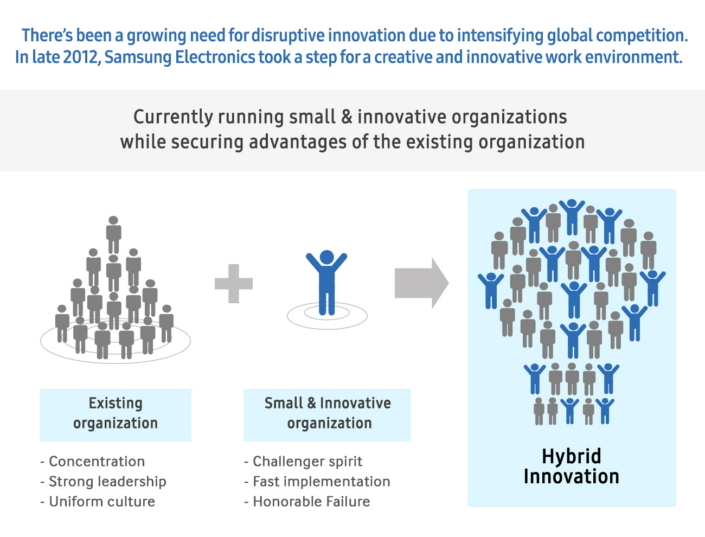 At Samsung, a unique startup culture has taken root in both spirit and implementation thanks to a progressive new structural and innovation-breeding initiative known as C-Lab. In Samsung’s growth into a technology leader, the company has, throughout its history, always taken time to introspect. Growing into one of the leading technology companies is a course filled with obstacles, requiring the ability to read into a complex mix of innovation, consumer, and societal trends. At Samsung, these seasons of introspection, have long been marked by concerted efforts to take a step back and appraise the bigger picture, and then move decisively. In the late 2000s, it was clear that the world around Samsung, and even the company itself, had changed dramatically over the space of the previous decade. While the company was continuing to grow with its brand recognized as a leader around the world and its products constantly at the top of their lists, Samsung and its leadership realized a season of deep introspection was needed to understand the changes, and then cast course for the years ahead. The company also realized that it had tended to concentrate its efforts in one direction – whether that was smartphones or TVs, for example. However, industry trends had subtly shifted in a new direction with the ability to be flexible, and diversify based on wider trends the real key to success and survival. Weaving together these insights, the Samsung C-Lab was born in 2012. 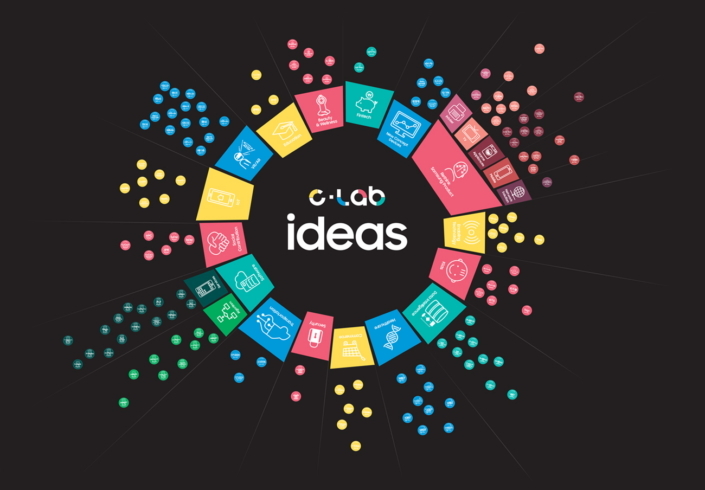 At core, Samsung’s C-Lab is an innovation program that helps employees to nurture their own creative business ideas. It encourages employees to create their own ideas and receive the resources and time to develop them. Its vision is to effect disruptive innovation at Samsung, instilling a spirit of adventure and startup culture throughout the company. The C-Lab isn’t a sideline. It’s not meant as an extracurricular program. It’s a strategic driver intended to shift the future paradigm of how Samsung operates for the years to come. The birth of the C-Lab didn’t just signal the arrival of a new program. It also ushered in a new way of working that wasn’t seen at Samsung before. The existing structure had strong leadership and uniform culture. But by incorporating the traits of a smaller startup, the effect was getting the best of both worlds. A challenger spirit and fast implementation was encouraged, with the result, a hybrid innovation structure. There was also the addition of a holacracy whereby there’s no hierarchy. Instead, a leader distributes power across project members in a simple organizational structure. Those who are proposing the ideas also have the power to staff their own teams. In fact, they can even recruit from outside of Samsung if they can’t find the right resources in-house. Workers operate in a flexible work environment. Failure is honorable if the employees are able to learn from them. The entire C-Lab procedure works like this. It begins with the idea discovery phase. This includes idea suggestions that Samsung welcomes throughout the year. Employees are also invited to a pitching day to explain the concepts they would like to develop. The concept stage is next, which includes team building and mentoring. Then comes prototyping, followed by concept validation. Here, the employees showcase their products at global events. If successful, the final stage is the exit stage. At this point, the businesses can remain under the Samsung umbrella or they can become separate spin-off companies. Because of the way C-Lab is structured, nearly any idea, irrespective of whether the idea fits into a current Samsung business or product scope is fair game as long as the team working on the idea can prove its merits. This sort of structuring has led to a ‘creative diversity’ of C-Lab ideas across unique categories, many never previously explored by Samsung. 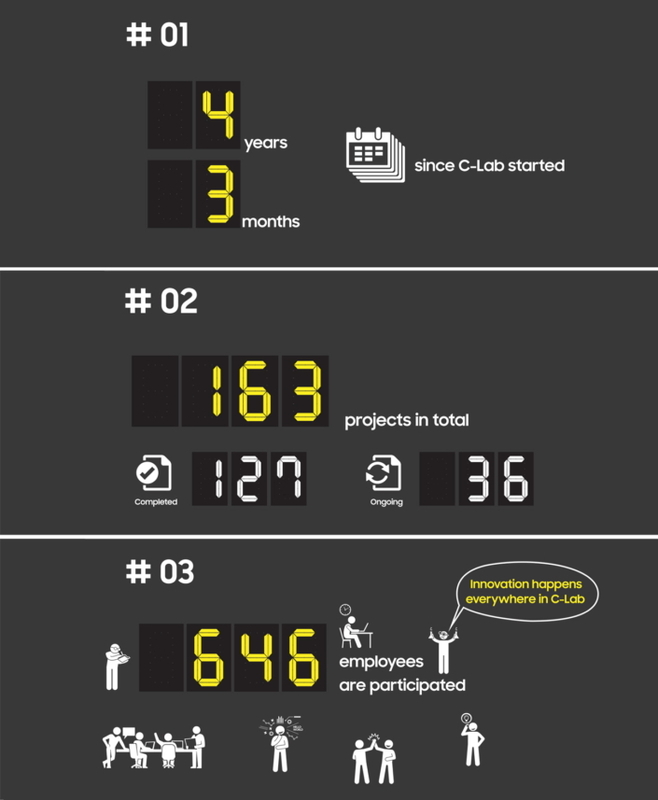 In the five years that C-Lab has been in operation, an exciting stream of successful projects have emerged. For example, there’s eyeCan – the eye-controlled mouse for those with disabilities. There’s also the hat that can detect signs of stroke, the sensor that can detect smells, and TipTalk – the wrist strap that enables users to make phone calls by putting their fingertips to their ears. Other ideas include RINK – the mobile VR controller, the smart belt WELT, and Mr. VR – the VR enhancing headphones. Of the 127 completed projects, 45% have been transferred to a Samsung business department. Another 35% of projects were completed and wound up. 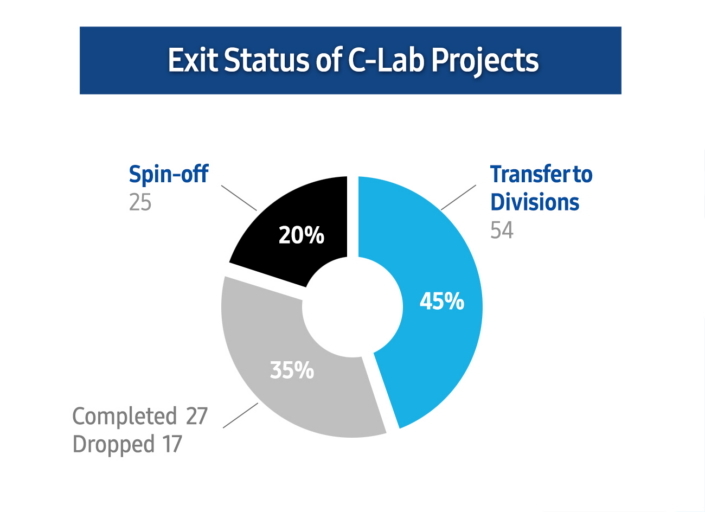 The final portion of projects are the 20% that have become spin-off companies. In 2015, C-Lab introduced its spin-off policy whereby the most promising projects are launched as fully-fledged external startups. So far, 25 projects have taken this exit route, with ambitious targets for the future. So after five years of operation, has the whole C-Lab project been worthwhile? The startup spirit reverberating throughout Samsung speaks for itself, enabling employees to be more than just employees. They’re creatives, idea generators, adventurers. Applications to participate in the annual C-Lab contest have increased year-upon-year, with around 2000 employees applying in 2016. Additionally, attendance by Samsung employees at the internal C-Lab Fair where teams showcase their works reached 6,800 last year. There’s no doubt that C-Lab projects are making a major impact globally, but perhaps even more special, has been employees carrying their passion back to their own business units. Knowing they can do extraordinary things with their own projects, this new sense of excitement from employees is tangible on how they can contribute to their day-to-day tasks. That is a big benefit for Samsung at large and the future of its products. Thanks to C-Lab, a new spirit of adventure and creativity is now reverberating throughout Samsung with optimism brimming about what’s more to come. 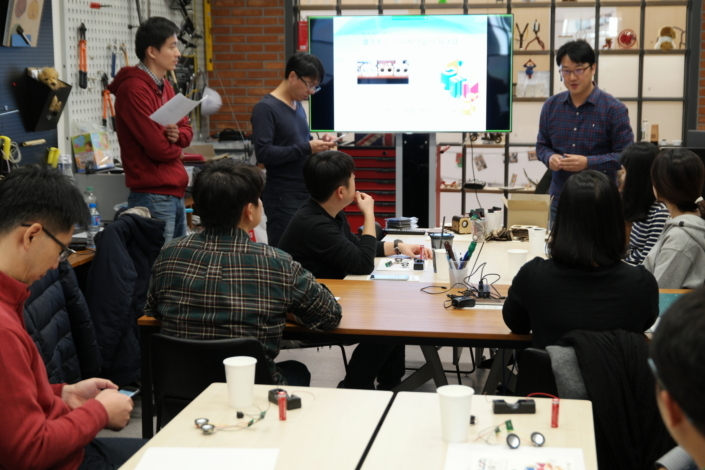 Projects have gone from humble beginnings to standout independent successes, participants are spreading the spirit of C-Lab back to their business units, and more and more Samsung employees are seeking to participate for themselves. As C-Lab and Samsung head into the future, it will be exciting to see what unfolds from this new spirit of adventure in what’s next to come.